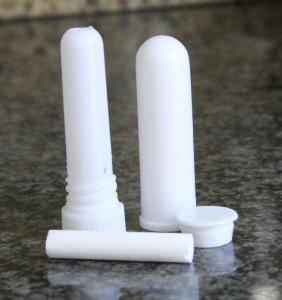 What are blank inhalers, also called Aromatherapy inhalers? They are nifty portable gadgets to carry precious essential oils around whenever you need them! Here is a picture of a blank inhaler. You can purchase them here. It consists of 4 parts: the outer shell, inner shell, cap and cotton wick. The inner shell houses the cotton wick and has 2 holes for the volatile essential oils to come out and into your olfactory organ. The cotton wick is made of highly absorbent cotton which in turn will soak up the essential oil blend you create! Previous postMoment & Motion – Step Afrika!